OTTAWA, January, 25th, 2011 – Canada should adopt a phased-in approach to climate harmonization policy with the U.S. to avoid delay in emissions reductions and maintain economic competitiveness. This measured approach would establish a ‘price collar’ that limits carbon price differentials between Canada and the U.S. and takes other national measures, says a new report by the National Round Table on the Environment and the Economy. Such a ‘made-in-Canada’ policy would allow Canada to achieve significant greenhouse gas reductions over the next 10 years even in the face of uncertain U.S. policy, address competitiveness concerns for industry, and pave the way towards greater harmonization later as American policy direction emerges, says the report, Parallel Paths: Canada-U.S. Climate Policy Choices. This is the third report in the NRTEE’s Climate Prosperity series examining the economic risks and opportunities of climate change for Canada. 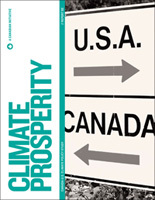 It contains extensive new economic modelling and analysis assessing whether Canada should lead, lag, or harmonize policy approaches with the United States and the consequences of doing so. It shows that the current policy of harmonizing greenhouse gas reduction targets with the United States requires a higher carbon price in Canada to achieve those targets. Alternatively, harmonizing with the U.S. on carbon prices alone, rather than on targets, means Canada’s GHG target of cutting emissions to 17% below 2005 levels by 2020 would not be met. Calling Canada’s pledge to harmonize climate policy with the U.S. “a sensible and realistic approach”, the NRTEE report suggests that a measured, Transitional Policy Option would build on current government regulatory approaches – such as the adoption of new vehicle emissions standards that mirror the U.S. – so as to both lower future costs of carbon abatement and reduce competitiveness risks of moving ahead in the face of continued U.S. policy uncertainty. It would ensure we continue to make real progress on our own emission reduction target for 2020, only 10 years away. “The Transitional Policy Option brings about real carbon abatement and emission reductions in Canada whether the U.S. implements equivalent policy or not”, states the report. 2. A National Cap-and-Trade System – with auctioning of permits and revenue recycling to cap emissions and address regional and sectoral concerns. 4. Technology Fund – to stimulate investment in needed emission reductions technologies. Parallel Paths illustrates policy options Canada can undertake to advance our environmental objectives while ensuring continued economic growth. It positions us now to harmonize along Canadian interests when U.S. policy direction is finalized later. It walks a middle line between harmonizing on carbon targets and carbon prices, balancing competitiveness concerns with environmental obligations. The carbon price collar would not exceed $30 more than the price in the U.S. so as to maintain economic competitiveness for energy-intensive, trade-exposed industrial sectors, yet still achieve significant emissions reductions. For the economy, this means average annual GDP growth (measured over 2005-2020), would be two-per-cent, one-tenth of a percentage point below what it would be without a policy. For the environment, the TPO moves us further towards meeting our 2020 targets, achieving cuts of three per cent below 2005 levels at a minimum, compared to emissions being at 10 per cent above 2005 levels in 2020 without such a policy. The report highlights the importance of low-carbon technology investment to realize future emission reductions. It proposes creating a new Canadian Low-Carbon Technology Fund financed through the compliance investments of carbon-polluting firms, which could reach between $500 million and $2 billion in 2020 depending upon the Canadian carbon price and corresponding U.S. policy. Recycling revenue back to industrial sectors, firms, and provinces would help ensure regional equity and fairness while targeting low-carbon technology development and deployment where it is needed most. “Harmonization, where possible and when feasible, make sense for Canada. But in the face of persistent U.S. uncertainty as to its own climate policy future, Canada will need to look to its own options, in the right way, at the right time.” said David McLaughlin, NRTEE President and CEO. The National Round Table on the Environment and the Economy is an independent federal advisory agency dedicated to preserving the environment while maintaining a strong economy.